Flexa baby & kids furniture is one of Europe’s most trusted brands and is now available in South Africa. The beautiful craftsmanship, top quality materials and utter originality of each piece is what sets FLEXA apart. FLEXA baby & kids furniture was founded in Denmark in 1972 and have remained at the forefront of furniture design for kids ever since. Carsten Dan Madsen, CEO of FLEXA, says: “High quality products for baby & kids is my passion, and I believe that we have the ability to create a better environment for kids to grow and develop in. We hope that your kids will enjoy our creativity and focus on high quality solutions for the most important room in the house – their room”. FLEXA baby & kids furniture works with designers, child development advisers and technical experts to ensure their creations are totally original. All FLEXA furniture is constructed from top quality wood collected from northern latitudes, and they use eco-friendly UV varnish which meets the stringent EU standards for lacquer. Their emphasis really is on making children’s surroundings safe, stimulating, creative and fun! Among the products available is the Flexa 5-in-1 baby cot bed which grows with the newborn baby until well past four years, going through five conversions to become a daybed. Equally ingenious and durable is the Adjustable High Chair which can be used until 12 years of age, with its ergonomic design featuring a removable tray, three adjustable seat heights and an adjustable foot rest. 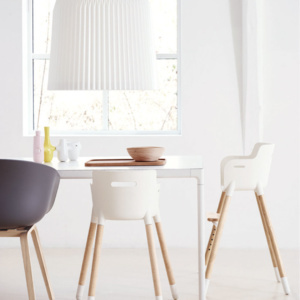 In 2013 this high chair, designed by Hans Sandgren Jakobsen, received one of the most prestigious accolades in the world of design, the Red Dot Design Award. The PLAY range has everything to furnish a stunning toddler’s room – it features single beds, tables, stools and shelves available in a choice of gorgeous shades of mint, rose or white, all with the distinctive FLEXA natural beech wood legs. The Shelfie range is perfect for optimizing space, and it never gets boring! The various storage combinations can be easily rebuilt, combined and adapted to grow with your child from toddler to teen. All the models feature a mixture of soft-close cupboards, drawers, adjustable shelves and organisers, and since it can be free standing there are endless possibilities for upgrading. FLEXA’s fun, functional and stylish furnishings are exactly why Scandivian design is so sought after. FLEXA is another trendsetting brand distributed exclusively in South Africa by Clever Little Monkey, the leading online kids platform. Im keen to find out how much these children’s bed and shelves cost? Please follow the link below to go to the product where you can find out more about any Flexa item. The Play beds are R3,690 and the Play wall shelves are R1,550.